Hialeah ( /ˌhaɪəˈliːə/) is a city in Miami-Dade County, Florida, United States. With the population of 239,673 at the 2018 United States Census, Hialeah is the sixth-largest city in Florida. It is a principal city of the Miami metropolitan area, which was home to an estimated 6,012,331 people at the 2015 census. It is located west-northwest of Miami, and is the only place in the county, other than Homestead, Florida, to have its own street grid numbered separately from the rest of the county (which is otherwise based on Miami Avenue at Flagler Street in downtown Miami, the county seat). Hialeah has the highest percentage of Cuban and Cuban American residents of any city in the United States, at 73.37% of the population, making them a typical and prominent feature of the city's culture. All Hispanics make up 94.7% of the city's population, the second-highest percentage of a Hispanic population in a U.S. city with over 100,000 citizens. Hialeah also has one of the largest Spanish-speaking communities in the country. In 2016, 96.3% of residents reported speaking Spanish at home, and the language is an important part of daily life in the city. In the early "Roaring '20s", Hialeah produced significant entertainment contributions. Sporting included the Spanish sport of jai alai and greyhound racing, and media included silent movies like D.W. Griffith's The White Rose which was made at the Miami Movie Studios located in Hialeah. However, the 1926 Miami hurricane brought many of these things to an end. The park's grandeur has attracted millions, included among them are names known around the world such as the Kennedy family, Harry Truman, General Omar Bradley, Winston Churchill, and J.P. Morgan. The Hialeah Park Race Track also holds the dual distinction of being an Audubon Bird Sanctuary due to its famous pink flamingos and being listed on the National Register of Historic Places. The famous aviator Amelia Earhart in 1937 said her final good-byes to the continental U.S. from Hialeah as she left on her ill-fated flight around the world in 1937. While Hialeah was once envisioned as a playground for the elite, Cuban exiles, fleeing Fidel Castro's 1959 revolution as well as World War II veterans and city planners transformed the city into a working-class community. 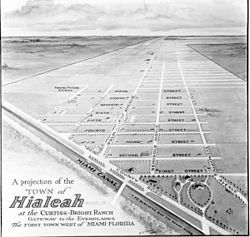 Hialeah historian Patricia Fernández-Kelly explained "It became an affordable Eden." She further describes the city as "a place where different groups have left their imprint while trying to create a sample of what life should be like." Several waves of Cuban exiles, starting after the Cuban Revolution in 1959 and continuing through to the Freedom Flights from 1965 to 1973, the Mariel boatlift in 1980, and the Balseros or boat people of the late 1990s, created what at least one expert has considered the most economically successful immigrant enclave in U.S. history as Hialeah is the only American industrial city that continues to grow. From a population of 1,500 in 1925, Hialeah has grown at a rate faster than most of the 10 larger cities in the state of Florida since the 1960s and holds the rank of Florida's fifth-largest city, with more than 224,000 residents. The city is also one of the largest employers in Dade County. In 2015 through 2016 the population in Hialeah grew from 234,714 to 235,626, a 0.39% increase. The median household income grew from $29,249 to $29,817, a 1.94% increase. In 2000, the age distribution of the population showed 23.0% under the age of 18, 8.2% from 18 to 24, 29.4% from 25 to 44, 22.9% from 45 to 64, and 16.6% who were 65 years of age or older. The median age was 43.5 years. For every 100 females, there were 92.7 males. For every 100 females age 18 and over, there were 89.6 males. 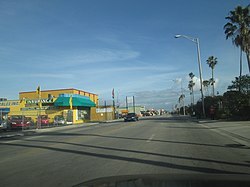 The city of Hialeah is a significant commercial center in Miami-Dade County. The city is host to national retailers such as Starbucks, Target, Best Buy, Walmart, Lowe's, and The Home Depot, as well as homegrown businesses such as Navarro and Sedano's. Hialeah is also home to vibrant community of mom-and-pop stores. These shops have successfully competed against national name brand retailers, outfitters, and franchises. In order to remain competitive national businesses have altered their traditional business strategy to meet the demands of the local community. Publix supermarkets opened a Publix Sabor along one of the city's main streets which caters to Latin American and Hispanic clientele. While most of the manufacturing and cloth industries that made Hialeah an industrial city in the 1970s–1980s have disappeared, new electronics and technology businesses have reinvigorated the local economy. Westland Mall contains over 100 stores and several restaurants. Macy's, J. C. Penney, and Sears are the main anchor stores located at the mall, while restaurants include Fuddruckers, IHOP, Los Ranchos Steakhouse, Chili's, Manchu Wok, and Edy's. Telemundo, the second largest Spanish-language TV network in the United States, was headquartered at 2340 West 8th Avenue in Hialeah until 2018. In March 2009, it was announced that a $40–$90 million restoration project was set to begin within the year on the Hialeah Park Race Track. On May 7, 2009 the Florida legislature agreed to a deal with the Seminole Tribe of Florida that allowed Hialeah Park to operate slot machines and run Quarter Horse races. The historic racetrack reopened on November 28, 2009 but only for Quarter Horse races. The park installed slot machines in January 2010 as part of a deal to allow for two calendar seasons of racing. The races went on all the way until February 2, 2010. Only a portion of the park has been restored, and an additional $30 million will be needed to complete this first phase of the project. The full transformation is expected to cost $1 billion since the plan includes a complete redevelopment of the surrounding area including the construction of an entertainment complex to include a hotel, restaurants, casinos, stores and a theater. In June 2010 concerns were raised over the preservation of Hialeah Park's historical status, as the planned development threatens to hurt Hialeah Park's status as a National Historic Landmark. The City of Hialeah is home to three tennis centers, five public swimming pools and aquatic centers, and more than 14 public parks totaling more than 100 acres (0.40 km2) combined. Milander Park features a municipal auditorium and a 10,000 seat football stadium. Amelia Earhart Park also serves the Hialeah community. Located just south of the Opa Locka Airport, the park consists of 515 acres, including a five-acre Bark Park for dogs. It offers a variety of amenities, programs and activities including mountain biking, soccer, Tom Sawyer's Play Island and Bill Graham Farm Village. It also houses the new Miami Watersports Complex, which offers cable and boat wakeboarding, waterskiing, wake surfing, kneeboarding and paddleboarding. 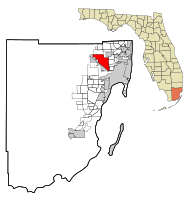 Hialeah is located within Florida's 25th Congressional District. It is currently represented in the House of Representatives by Mario Diaz-Balart, a Republican. According to the nonpartisan Bay Area Center for Voting Research (BACVR) Hialeah, Florida is the fourth most conservative city in the United States. The current mayor of Hialeah is Carlos Hernández. 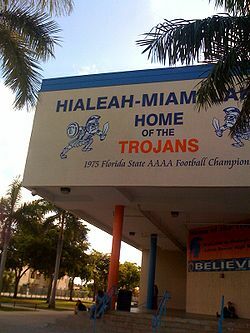 Miami-Dade County Public Schools serves Hialeah. Two high schools serving the Hialeah community, Mater Academy Charter High School and Miami Lakes Tech, were named as "Silver" award winners in U.S. News & World Report's "Best High Schools 2008 Search". Miami-Dade College Hialeah Campus has served as the city's academic center since 1980. Besides its academic mission, the campus also sponsors numerous cultural and community events. Hialeah's public library was founded in 1924, one year prior to the incorporation of the city. While over the years the county-wide Miami-Dade Public Library System has taken over the libraries of most of the cities in the county, Hialeah public libraries function independently from the county-wide system. ^ "Biography of the Mayor". Hialeahfl.gov. Archived from the original on March 10, 2012. Retrieved August 4, 2012. ^ "United States Census". census.gov. Retrieved 30 January 2019. ^ a b c d e f "History of Hialeah". City of Hialeah, Florida. Archived from the original on 2014-07-13. Retrieved August 5, 2012. ^ a b c d "Hialeah History at Hello Hialeah". Hellohialeah.com. Archived from the original on July 22, 2012. Retrieved August 5, 2012. ^ a b "Hialeah Historian". Princeton.edu. March 27, 2002. Retrieved August 5, 2012. ^ Zumbrun, Joshua. "In Pictures: America's 10 Most Boring Cities". Forbes. ^ "U.S. Decennial Census". Census.gov. Archived from the original on May 12, 2015. Retrieved April 19, 2014. ^ "Annual Estimates of the Resident Population: April 1, 2010 to July 1, 2012". Archived from the original on October 19, 2013. Retrieved April 19, 2014. ^ "Ancestry Map of Cuban Communities". Epodunk.com. Retrieved October 30, 2007. ^ "Ancestry Map of Colombian Communities". Epodunk.com. Retrieved October 30, 2007. ^ "Ancestry Map of Dominican Communities". Epodunk.com. Retrieved October 30, 2007. ^ "Ancestry Map of Honduran Communities". Epodunk.com. Retrieved October 30, 2007. ^ "Ancestry Map of Nicaraguan Communities". Epodunk.com. Retrieved October 30, 2007. ^ "MLA Data Center Results of Hialeah, Fla". Modern Language Association. Retrieved October 30, 2007. ^ a b Cusack, Liam (December 2012). "The South Florida Cooperator". Retrieved May 4, 2015. ^ Keller, Amy (October 1, 2007). "Publix's New Flavor". Florida Trend. Retrieved May 4, 2015. ^ Griffin, Justine (July 10, 2012). "First Publix Sabor in Palm Beach County opens in Lake Worth". Sun-Sentinel. Retrieved May 4, 2015. ^ "Energy Saving Device, "The Guardian," Provides Green Solution To Energy Bills". Prweb.com. Retrieved August 4, 2012. ^ "Legal corporate". Telemundo. Archived from the original on 2009-03-01. Retrieved February 3, 2009. ^ "Hispanic Viewers Hooked on the New American Idol: Barack Obama". HispanicBusiness.com. January 29, 2009. Archived from the original on March 5, 2009. Retrieved August 4, 2012. ^ Freer, Jim (April 16, 2009). "Owner: Legislation Key to 'New' Hialeah". BloodHorse.com. Retrieved August 28, 2013. ^ "Hialeah Park and Race Track". The Miami Urbex. Blogspot. June 8, 2013. Retrieved August 28, 2013. ^ "The rebirth of Hialeah Park: Racing returns Nov. 28". Sun Sentinel. All Voices. September 17, 2009. Archived from the original on December 3, 2013. Retrieved August 28, 2013. ^ "City of Hialeah Recreation Parks and Facilities". Hialeahfl.gov. Archived from the original on July 7, 2012. Retrieved August 4, 2012. ^ "Miami-Dade County - Parks, Recreation and Open Spaces - Amelia Earhart Park". Miamidade.gov. June 22, 2012. Retrieved August 4, 2012. ^ "Hialeah Dental Clinic Turns 10[permanent dead link]." Gator Dentist Today. University of Florida College of Dentistry. Northern hemisphere Fall of 2007. p. 4. Retrieved on April 15, 2012. ^ "Directory of Representatives". The United States House of Representatives. Retrieved August 28, 2013. ^ "Study Ranks America's Most Liberal and Conservative Cities". Govpro.com. August 16, 2005. Archived from the original on July 22, 2012. Retrieved August 4, 2012. ^ Benjamin S. Brasch; Joey Flechas (August 2, 2013). "There candidates for mayor in Hialeah". Miami Herald. Retrieved August 28, 2013. ^ Peter D. Klingman (1974). "Ernest Graham and the Hialeah Charter Fight of 1937" (PDF). Tequesta. Historical Association of Southern Florida. 34. ISSN 0363-3705 – via Florida International University. ^ "Elections History". City of Hialeah. Archived from the original on 2017-05-12. Retrieved May 17, 2017. ^ Thomas J. Wood (1964). "Dade County: Unbossed, Erratically Led". Annals of the American Academy of Political and Social Science. 353. ^ Lawrence Kestenbaum (ed.). "Mayors of Hialeah, Florida". Political Graveyard. Retrieved April 26, 2017. ^ "Biography of Mayor". City of Hialeah, Florida Official Web Site. Archived from the original on August 20, 1999 – via Internet Archive, Wayback Machine. ^ "Biography of the Mayor". City of Hialeah. Archived from the original on December 20, 2006. ^ "2009-10 School List by Elected Officials, 12-11-09.XLS" (PDF). Retrieved October 24, 2012. ^ "Best High Schools in the US | Top US High Schools". US News & World Report. Retrieved August 14, 2012. ^ "Introduction to CCS". Champagnatcatholicschool.com. February 9, 2012. Retrieved August 4, 2012. ^ "Immaculate Conception Catholic School". Icsmiami.org. Retrieved October 24, 2012. ^ Padgett, Tim. "A Florida Epidemic: Female Teachers Sleeping with Their Students." Time. Friday May 29, 2009. Retrieved on May 29, 2009. ^ "St John The Apostle School". stjohntheapostleschool.com. Retrieved August 4, 2012. ^ "MDC Hialeah Campus". Mdc.edu. Retrieved August 4, 2012. ^ "Our History". City of Hialeah. Archived from the original on 2013-11-03. Retrieved November 2, 2013. ^ "History of the Miami-Dade Public Library System" (PDF). Miamidade.gov. Retrieved April 24, 2015. ^ "Welcome to the Hialeah Libraries!". HialeahFL.gov. Retrieved April 24, 2015. ^ Munzenrieder, Kyle (August 28, 2013). "Allstate Claims Hialeah Has America's 4th Worst Drivers, Miami 8th". Riptide. Miami New Times. Retrieved August 28, 2013. ^ Palmer, Brian (July 25, 2013). "Which U.S. City Has the Worst Drivers?". Slate. Retrieved August 28, 2013. 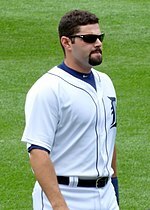 ^ "Alex Avila Stats". ESPN. Retrieved August 28, 2013. ^ "Devin Bush, FS at NFL.com". National Football League. Retrieved August 28, 2013. ^ Rubin, Sam (March 15, 2013). "Maria Canals-Barrera & David DeLuise On "The Wizards Return"". KTLA. Retrieved August 28, 2013. ^ "Judo Olympian Capo dies at 48". USA Today 30. July 7, 2009. Retrieved August 28, 2013. ^ "Harry Wayne Casey". TMZ. Retrieved September 10, 2013. ^ Bill Buchalter (March 30, 1986). "Chris Is Dominating Name In State Basketball Miami Lakes' Corchiani, Washington's Davis Head Boys', Girls' All-southern Squads". Orlando Sentinel. Retrieved September 10, 2013. ^ "Jack Daugherty". Baseball-Reference. Sports-Reference. Retrieved November 13, 2014. ^ Whitty, Stephen (May 9, 2010). "Two-time Oscar nominee Catherine Keener has earned a reputation for mastering complex roles". New Jersey. Retrieved April 24, 2015. ^ Tester, Hank (September 23, 2010). "All Grown Up: The Face of the Cuban Rafter Crisis". NBC Miami. Retrieved September 10, 2013. ^ "LINCCWeb Catalog Search". go.galegroup.com.db16.linccweb.org. Retrieved 2018-09-20. ^ Wine, Steven. "Vet WR Timpson returns home to play for Dolphins", Associated Press, July 28, 2007. Accessed December 23, 2007. "That was in 1985, when Timpson was a highly sought prospect from Hialeah-Miami Lakes High School."